The 2017-2018 school year was sooooooo much better than last. Last year we had good teachers and a lot of fun but this year lacked things like incredibly difficult IEP meetings and open heart surgery. 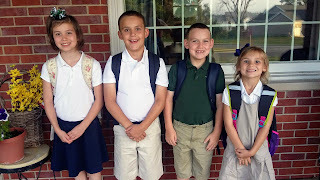 There were a few bumps along the way - which is life - but overall we loved 4th, 2nd, 1st, Kindergarten, and Pre-K4. 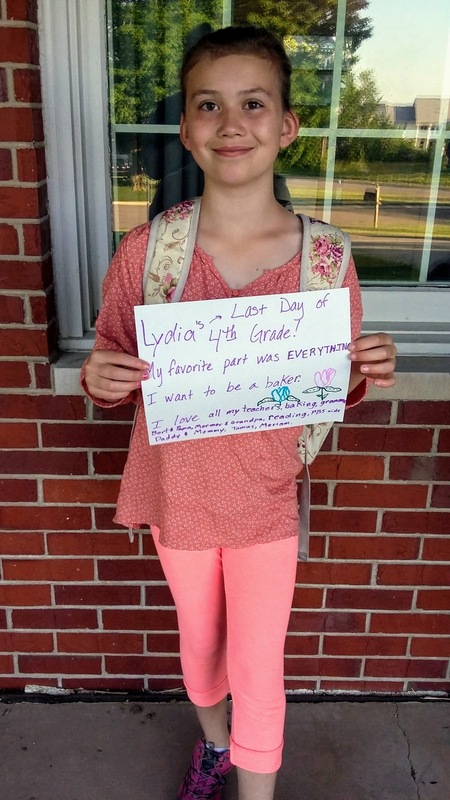 This year L loved her teacher, broke her right arm roller skating, began altar serving, and earned eight badges in American Heritage Girls. 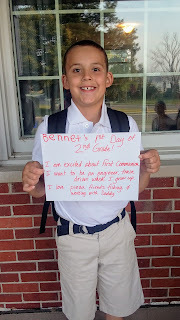 Ben had a beloved teacher this year, made his first confession, and received his First Holy Communion. 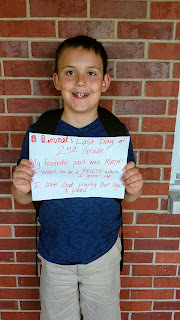 He also had a lot of fun in Boy Scouts, got braces, and impressed us with his penmanship and ability to retell Bible stories. JF spent his mornings at our parochial school for Religion and then headed to the public school for the rest of the day. His teachers and aids were all amazing and he really made ground in speech and reading. 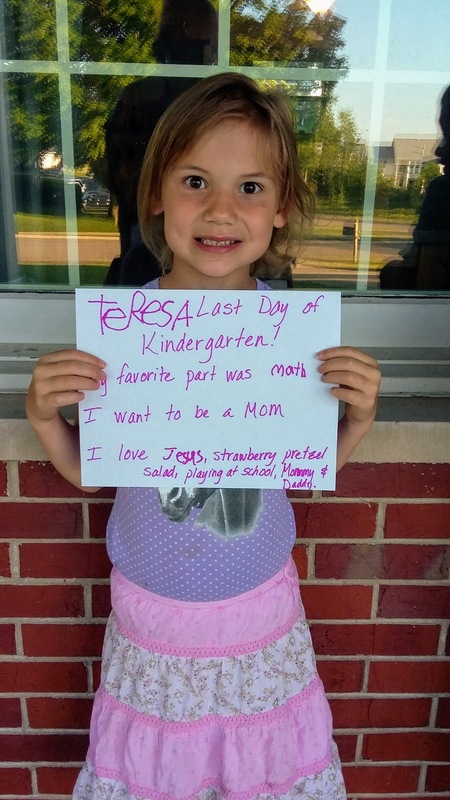 Resa L O V E D kindergarten. 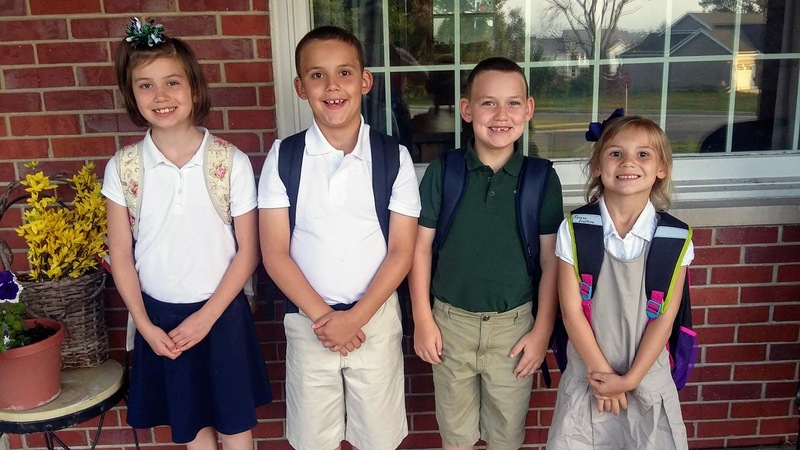 She loved her classmates, she loved her teacher, she loved learning, she loved recess. The only thing she didn't love was being hot in the air condition-less school. Jofis got a lot out of pre-k4 but he also struggled a bit. Some of his classmates were a year older than him and the gap was obvious at times. 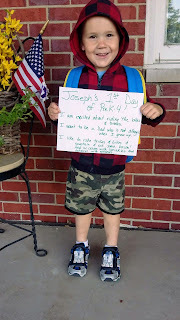 He had a great teacher and some really good friends last year but he'll be doing pre-k4 again next year so he can really be ready for kindergarten instead of struggling and hating school. 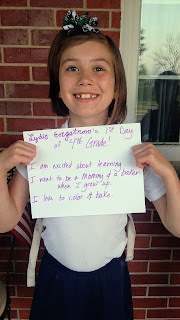 "I am excited about learning. I want to be a Mommy and a baker when I grow up. I love to color and bake." "My favorite part was EVERYTHING. I want to be a baker. I love all my teahcers, baking, Granma Bert and Papa, Mormor and Grandpa, reading, PBS Kids, Daddy and Mommy, Tomas, Meriam"
"I am excited about First Communion. I want to an engineer, train driver, when I grow up. I love pizza, friends, fishing, and working with Daddy." 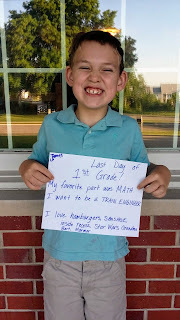 "My favorite part was Math! I want to be a priest when I grow up! I love God, playing ball tag, and pizza." 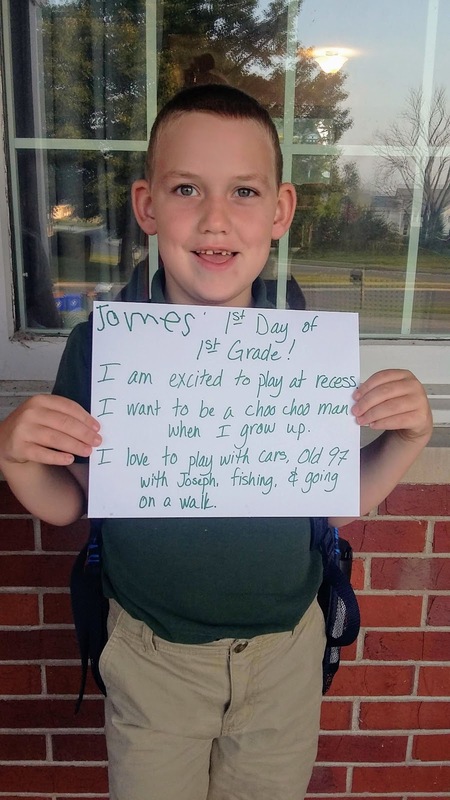 "I am excited to play at recess. 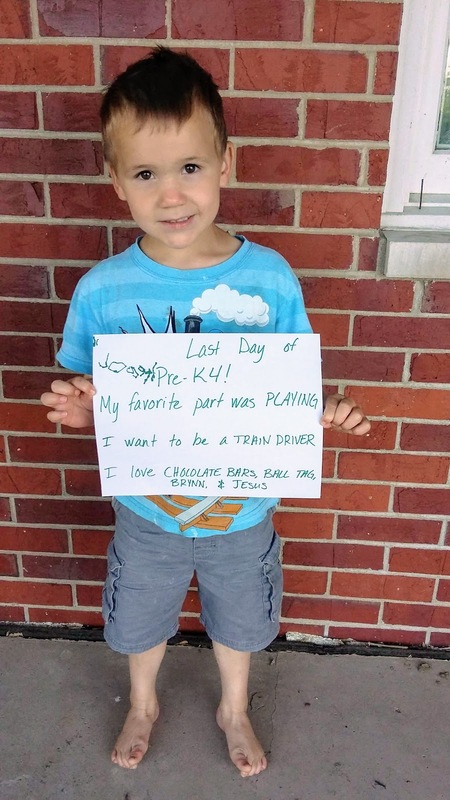 I want to be a choo choo man when I grow up. 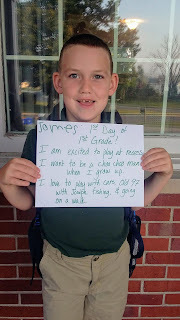 I love to play with cards, play Old 97 with Joseph, fishing and going on a walk." 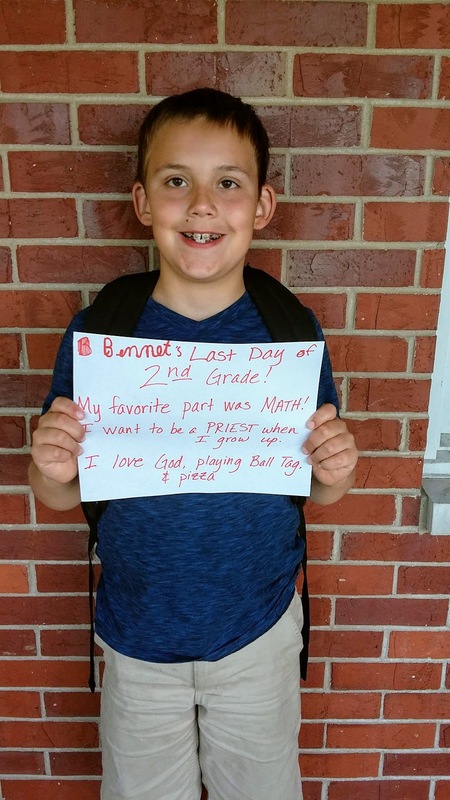 "My favorite part was Math. I want to be a train engineer. 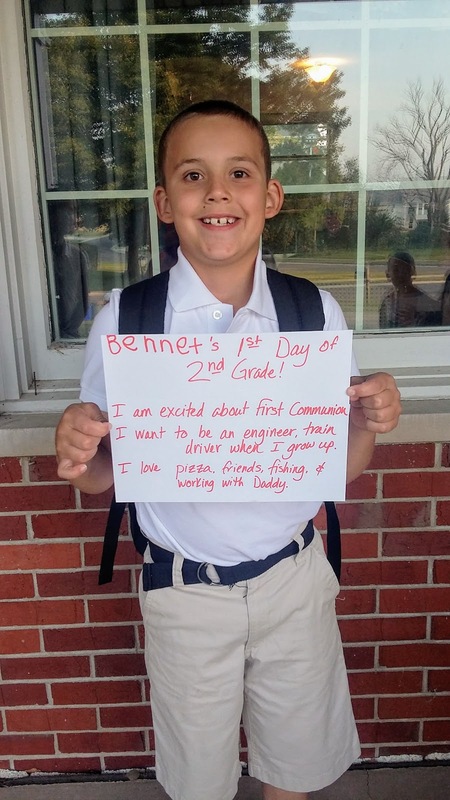 I love hamburgers, sausage, inside recess, Star Wars, Grandma Bert, Mormor." 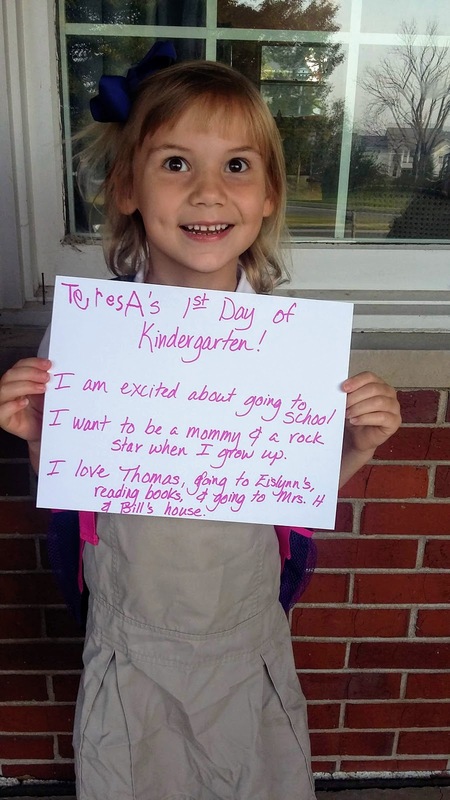 Thomas, going to Neighbor's house, reading books, and going to Mrs. H and Bill's house." 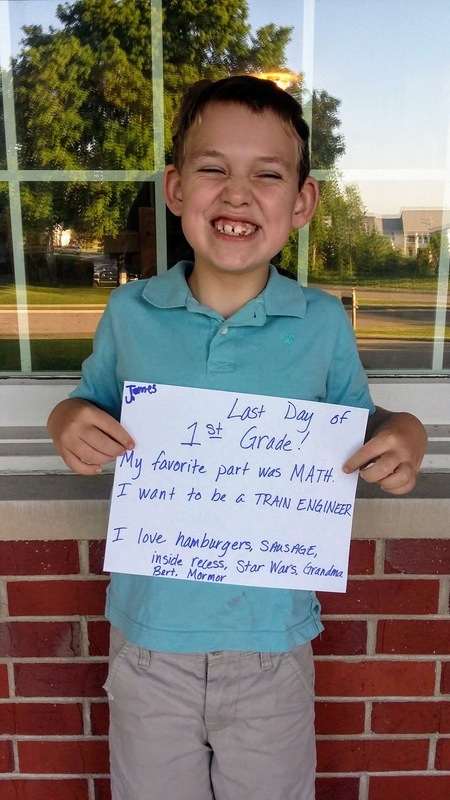 "My favorite part was Math. I want to be a Mom. I love Jesus, strawberry pretzel salad, playing at school, Mommy and Daddy." 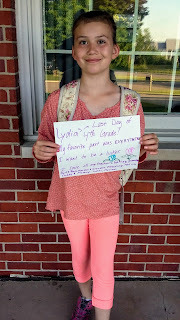 "I am excited about riding the bikes and trikes. I want to be a Dad who's not allergic when I grow up. I like to ride bikes and trikes and scooters and eat. some. bacon! And ice cream with sprinkles and oatmeal with sprinkles." "My favorite part was playing. I want to be a train driver. I love chocolate bars, ball tag, B from school, and Jesus." 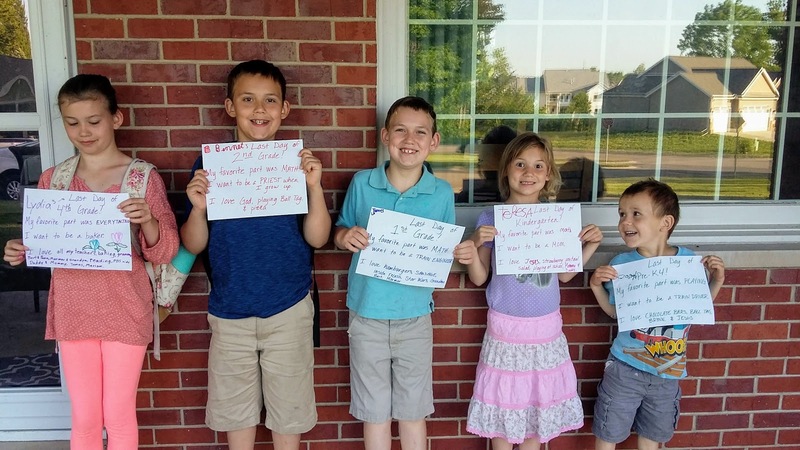 We have some fun things planned for the summer - the library reading program, a trip to a Lodge, and lots of adhering to the Summer Daily Schedule. We'll see how this goes. Hi Bonnie! Love seeing the end of school posts - what a lovely year for your children! I come over here regularly so I can click through and place my amazon order. But I don't see the button - are you still an Amazon affiliate? n.